"We must know before we can love. In order to know God, we must often think of Him. And when we come to love Him, we shall then also think of Him often, for our heart will be with our treasure " … Brother Lawrence's The Practice of the Presence of God. The way to know God is by reading the gospels. Gospel is interpreted Good News - God's good news to His world. It is the new testament and perspective we must have in order to know and love Him as He means us to know and love Him. The gospel of John is called the gospel of love. And, indeed, it is a love story, written by that disciple whose heart was totally surrendered. Brother Lawrence, whose heart was also totally surrendered, was a great believer in doing what was most practical, simple, and direct. 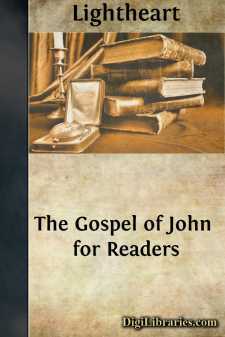 The Gospel of John for Readers is the KJV lovingly and faithfully adapted to a flowing narrative style to allow for easy reading enjoyment. May it help us all to see the exquisite beauty and simple yet practical message of God's good news through eyes of love. 1. In the beginning was the Word, and the Word was with God, and the Word was God. The same was in the beginning with God. All things were made by Him. Without Him was not any thing made that was made. In Him was life; and the life was the light of men. The light shineth in darkness; and the darkness comprehended it not. There was a man sent from God whose name was John. He came to bear witness of the Light that all men through Him might believe. John was not that Light, but was sent to bear witness of that Light. That was the true Light, which lighteth every man that cometh into the world. He was in the world, and the world was made by Him, and the world knew Him not. He came unto His own, and His own received Him not. But as many as received Him, to them He gave power to become the sons of God, even to them that believe on His name: those who were born not of blood, nor of the will of the flesh, nor of the will of man, but of God. And the Word was made flesh and dwelt among us. And we beheld His glory, the glory as of the only begotten son of the Father, full of grace and truth. John bore witness of Him and cried, saying, This was He of whom I spoke. He that cometh after me is preferred before me because He was before me. We have all received of His fullness, grace for grace. For the law was given by Moses, but grace and truth came by Jesus Christ. No man hath seen God at any time. The only begotten Son, which is in the bosom of the Father, hath declared Him. And this is the record of John, when the Jews sent priests and Levites from Jerusalem to ask him, Who art thou? And he confessed and did not deny. He confessed, I am not the Christ. And they asked him, What then? Art thou Elias? And he saith, I am not. Art thou that prophet? And he answered, No. Then said they unto him, Who art thou that we may give an answer to them that sent us? What sayest thou of thyself? He said, I am the voice of one crying in the wilderness, Make straight the way of the Lord, as was said by the prophet Esaias. And they who were sent by the Pharisees asked him, Why baptizest thou then if thou be not that Christ nor Elias nor that prophet...?